Beverage service can be a major profit generator for any size operation. Offering soft drinks is an important component to the overall experience of the customer, as well as additional profits for the operator. Drink stations provide some advantages by serving drinks as a stand-alone beverage or as a mixer for liquor sales at a central location. Mobile bars are more advantageous since they can be moved easily from site to storage to host any occasion and can be self-sufficient profit centers. Mobile bar systems are preferable to a skirted table since they provide a professional and durable work surface at standing height. 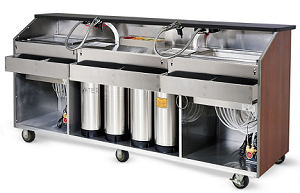 All FWE bars provide a durable stainless steel work surface, sink and storage area in model styles to accommodate conventional, pre-mix, post-mix dispensing or bag-in-box systems. Before we get into specifics about how different dispensing systems work, it is helpful to have some basic knowledge about how soft drinks are made. Water: Since water is the basic ingredient in every soft drink, bottlers go to great lengths to filter and treat water to prevent impurities which could affect the overall consistency and taste of the drink. As cold water attacks and absorbs carbonation (CO2), the colder the water at the time of carbonation, the better the product. So for the best results, water should first be chilled and then passed through the carbonator with the CO2, and then mixed with syrup. Carbonation: Once purified water is chilled, it then has to be carbonated. Soft drinks have a variety of 'carbonation volumes' (CO2 levels). Depending on the type of soda, different ratios of water to CO2 are required. Syrup: Just as there are varying ratios of water to CO2, different products are mixed at various ratios of carbonated water to syrup. For instance, a Cola has a 5:1 ration (5 parts carbonated water 1 part syrup). It is critical to maintain this ratio - if the water ration is too high, the drink will taste weak and watered down. If the water ratio is too low, a strong, overly sweet drink will result. Conventional Bar Service is considered the entry level style of beverage service since equipment for a dispensing system is not required, only the investment of the bar structure itself. With conventional service, cans and bottles of product are stored to be used for beverage service. As the bottling company has already taken care of preparing the product in the right ratios, this is the simplest and the most 'fool-proof' way to serve soft drinks. For small volume operations, a conventional bar is a profitable solution and adds to the overall ambiance. This mobile work station is more comfortable and practical for the bar tender than using a skirted banquet table for beverage service. FWE's CB Series bars provide a durable stainless steel work surface at 'bartending height', a built-in ice sink with drain that holds 60 lbs. of ice, stainless steel storage areas that keep the cans and bottles easy to manage without frequent restocking, removable bottle speed rail to support bottles and prevent breakage, a 4-bowl server for drink garnishes, and a convenient towel ring! Pre-Mix System is the first step into a delivery system for soda. Pre-mix soda systems are delivered to the operation pre-mixed (pre-carbonated) in 5 gallon tanks, ready to use. Pre-mix requires installation of dispensing equipment: a dispensing 'gun' regulator and CO2 tank used for propelling the pre-mix. Even though water is not required for the pre-mix, a water tank, lines and fittings are generally included for the convenience of dispensing as a mixer for liquor. The system is available from FWE, or a beverage supplier of choice (Coke, Pepsi, ect.) can provide and install the system. The pre-mix system is an excellent investment for a low to medium volume operation, or an operation without a power source available near the serving area, as no power source is required. Pre-mix systems provide a good return on investment since the product is in tanks, it has a long shelf life for excellent and consistent soft drink servings. Pre-mix systems serve a higher volume at less cost than convention bars. The expense for the purchase of the pre-mix dispensing equipment itself, compared to the zero investment of conventional bar service, is still less than the most expensive post-mix or bag-in-box system equipment for a low to medium volume operation. Post-Mix System is more sophisticated than the pre-mix system since the soft drink is delivered to the operator in a concentrated mix and is carbonated at the point of dispensing. The system starts with water from 5 gallon tanks passing through the cold plate to chill the water. The colder the water, the better the absorption of the CO2 after the water passes through the carbonator. Once the water is carbonated, chilled syrup is then mixed at the dispensing gun. Since the carbonator requires power, this system is best suited for operations with readily available power sources. Though the more complex post-mix system equipment has a larger initial investment than a pre-mix system, post-mix can be 2 to 3 times less expensive to operate on a price per serving basis. Post-mix is a better investment for the medium to large volume operation. Also, because the product is concentrated and purchased in 5 gallon tanks, it will last must longer. An additional advantage of post-mix is that there are fewer tanks to move, store or change out. Bag-in-box (BIB) System is a form of post-mix in which the soft drink syrup is handled in 12" square boxes instead of 5 gallon cylinder shaped tanks. Syrup in boxes requires less storage space than syrup in tanks and each box is discarded after use instead of being stored for exchange or pick-up by bottler. A pump per flavor is required to move the syrup from the bag and is propelled by CO2 to the cold plate for chilling. The chilled water from 5 gallon tanks passes through the carbonated water and syrup from 5 gallon bags are mixed at the dispensing gun. As with the post-mix system, a power source is required for the carbonator. 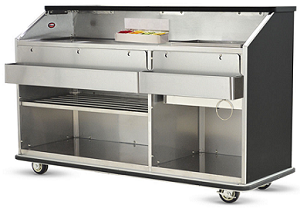 No matter what system you choose, all mobile bars are made for mobile applications. All bars are constructed with a one piece stainless steel tubular welded base frame, and designed to absorb vibration and shock during transport. From the ground-up our mobile bars are constructed of quality materials built to last for years, FWE solid stainless steel construction will withstand continuous, demanding use and will outperform all other brands. 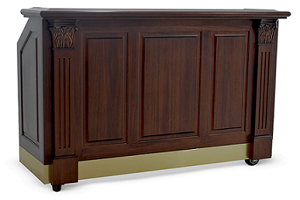 FWE offers a variety of features and options for your mobile bar applications, including many design options ranging from all stainless steel to laminate exteriors to our elegant wood series. To learn specifics, see literature, additional photos and get a quote, click here.